Asher Green Mens Glitter Suede Spike and Studded Smoking Slipper, Slip On Dress Shoe, Style AG5001 by Asher Green at SCRHI. Hurry! Limited time offer. Offer valid only while supplies last. All eyes on you: These spike and pyramid studded genuine glitter sprayed suede tuxedo smoking slippers are the ultimate statement-making dress shoe. 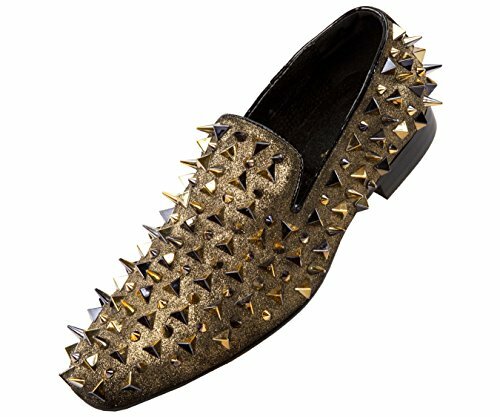 All eyes on you: These spike and pyramid studded genuine glitter sprayed suede tuxedo smoking slippers are the ultimate statement-making dress shoe. Whether it's for the holidays, a special occasion such as prom, or simply for a night out, these eye-catching shoes are essential for elevating your entire outfit. The classic smoking slipper silhouette is completely covered in glitter with matching metallic metal studs, giving this slip-on an eye-catching designer look. A low block heel and leather lining make these loafers comfortable to wear and easy to slip on. Take your look to the next level and add some major star power to your next night out on the town with these luxurious shoes.